The day was rather hot one weekend and I drove my Honda Civic out to run some errands. I had the air conditioner on and all of a sudden, my car stalls and the Engine Light on my dashboard came on. Fortunately, there was an auto parts store nearby where I bought a new set of Spark Plugs. After replacing the old ones, I was able to restart the car and make it back home but the Engine Light never went away. I went through my Honda Service Manual and came across a device that could be used to identify all error codes produced by the car's computer when the Engine Light comes on. Luckily I have a backup car I reserve for emergencies like this. So off to the auto parts store again as I searched for a reasonable and compatible On-board Diagnostics 2 (OBD2) scanner. Some older cars used OBD1. The auto parts store offered the option of allowing customers to borrow their OBD scanner for just a few days but I figured it might be nice and more convenient to just have my own handy OBD scanner. The least expensive one had a price tag of about $40 which only tell you the error code. The higher end models were as high as $200 with error codes, code description, and real-time status on all your car's sensors. I just couldn't resist so I purchased the second to the highest end model. After plugging in the OBD Scanner to a port underneath the dashboard, I started the ignition and waited for the results. 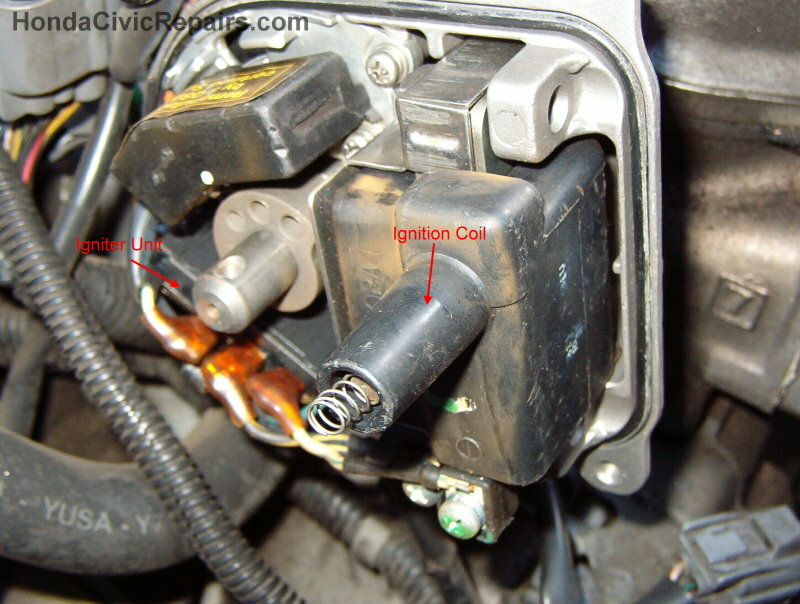 The error code identified that there was a problem with the ignition or misfiring. From reading the Honda Service Manual, it led me to inspect the Distributor. First, I went out and bought a Distributor Cap. Replaced the old one and cleared the Engine Light through the OBD scanner. After driving the car for a while, the Engine Light returned. This time i decided to replace the Distributor. 2. 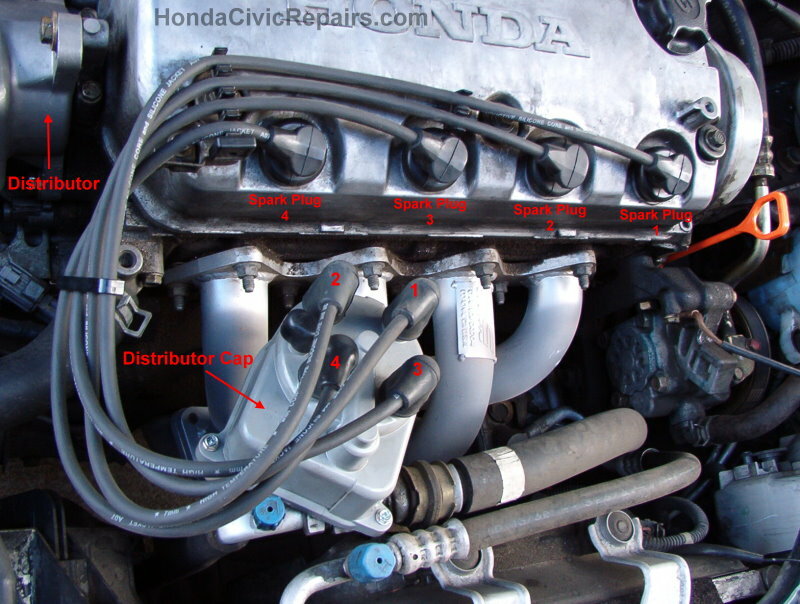 Took a digital shot of the original configuration of the Spark Plug Cables to the Distributor Cap for backup reference. 3. Disconnected the Spark Plug Cables off of the Distributor Cap. 4. Removed the screws off the Distributor Cap. 5. Removed the Distributor Cap. 7. Detached 2 wire harnesses connected to the distributor. 9. Carefully removed the Distributor off the engine. 10. Wiped off any oil spilled from the engine. 11. Positioned the rotor on the new Distributor identical to the old distributor. 12. Installed the new Distributor. 13. Bolted the Distributor securely in the original position. 14. Screwed the Distributor Cap back on. 15. Reconnected the Spark Plug Cables onto the Distributor Cap in their original positions. After starting the car, the Engine light automatically disappeared! Success! I�ve been driving the car around for several weeks now and it looks like that really did the trick.